Let’s play a game of hypotheticals. Say you were Dabo Swinney, head coach of the Clemson Tigers. The Tigers have to be considered the top power in College Football this year, as they have looked impressive during their undefeated run. Or say you were Nick Saban, heading an Alabama team that has looked superb since a September stumble against an amped up the Ole Miss squad. Say you were a coach of a sure-fire College Football Playoff team. Who would you NOT want to play come New Year’s Eve? Is it fourth-ranked Notre Dame? The Irish have some good wins on the season despite being possibly the most beat-up team in the nation this year, but they just barely beat a Boston College team that had lost its last six games and was shut out by Wake Forest (!). Notre Dame has only two wins over currently ranked opponents: Navy and Temple. They did play Clemson close, but that game was in early October. Forgive me for saying that this Fighting Irish team shouldn’t scare Clemson in a potential rematch (or Alabama for that matter, who I think is actually better than Clemson). Never mind the fact that they have to play Stanford on the road this Saturday. Is it No. 3 Iowa? Sure, they are an undefeated team from a Power 5 conference, but look at their schedule. It’s not exactly a who’s who of the B1G. A win over Northwestern isn’t really a win you can hang your entire playoff argument on. They’ll have an opportunity to add to their resume in the B1G title game, but does anyone see them as a sure thing against Michigan, Michigan State, or Ohio State? The point here is that if you were Saban or Swinney, you’re not scared of the teams ranked No. 3 and No. 4 in the College Football Playoff Rankings. In fact, you’re hoping these rankings hold true for the rest of the season. Vernon Adams has the Ducks flying high to close the season. The pair agrees on the top three teams, in the same order: Alabama, Clemson, and the Oklahoma Sooners. 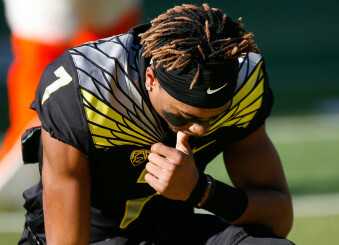 While Kiper adds Ohio State in the mix as his fourth team, McShay chose our Oregon Ducks as his fourth team that nobody wants to play. Again, this is not to say that the Ducks deserve a playoff spot after losing three games and a chance at the Pac-12 North title with Cal’s loss to Stanford this past Saturday. However, with a healthy Vernon Adams and a defense that seems to play better every game, the Ducks appear to be playing in playoff form. McShay mentions that Oregon is scoring 47.8 points per game with VA at the helm. They have impressive wins over Stanford (which is holding on to an outside chance at the playoff should they win against Notre Dame this weekend) and USC (a team that could represent the Pac-12 South against the Cardinal with a win this week against cross-town rival UCLA). 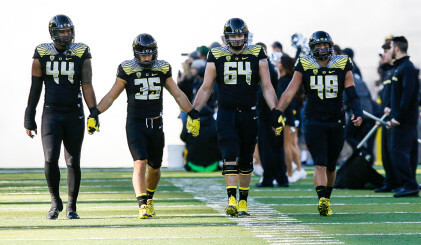 Oregon must pray Stanford can win out and make the Playoff so the Ducks can sneak into the Rose Bowl. What if Adams hadn’t been hurt against Eastern Washington? Would we be one of those teams in the hunt for another berth in the College Football Playoff? Would Dabo and Nick be scared of us? The best the Ducks can hope for now is that Stanford beats Notre Dame, wins the Pac-12 title, and somehow edges its way into the fourth seed in the playoff. Oregon would then have an opportunity for an at-large bid to the Rose Bowl, which would be a nice consolation prize for a season that feels like it was stolen away. Who would have thought the Ducks would have even an outside chance at a Rose Bowl appearance following a 3-3 start? Fans can take solace in the fact that this program looks like it is far from done. While Adams will not return next season, recruiting efforts have seen good returns at the quarterback position, with a number of highly touted players set to enter the program. They still have work to do (beat Oregon State), but this season is far from the failure many thought it was at the midway point. For now, all we can do as fans is enjoy this flash of brilliance and know that the top teams in the country would rather play anyone but us. That, and root for Stanford, however hard that may be. 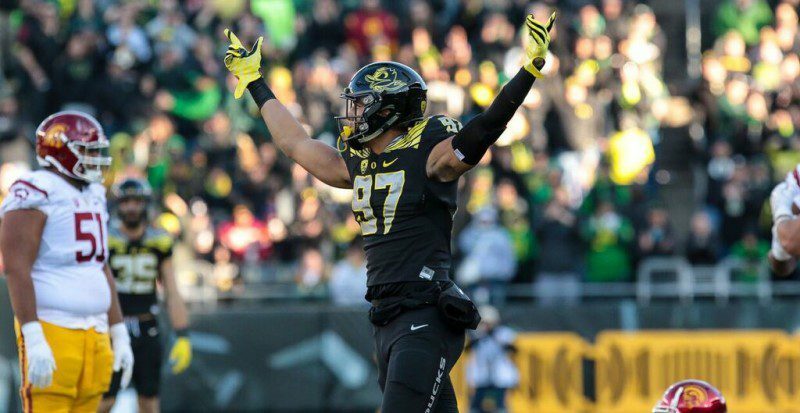 Oregon fans can be happy with the way the Ducks finished this season.